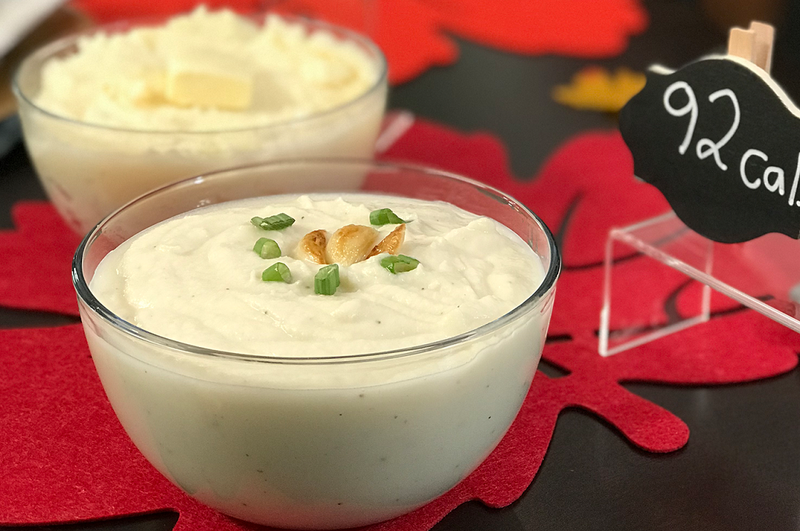 The perfect MASH recipe to substitute your traditional 295 calorie mashed potato dish this Thanksgiving! Swap out your potatoes for cauliflower heads and take note of this DELICIOUS 92 CALORIE estilo Yes You Can! #Cauliflower Mash! Boil water in large pot. Add salt to water just prior to boiling point to add flavor while cauliflower cooks. Drop cauliflower into boiling water and cook 8 to 10 minutes without lid. Drain cauliflower and water from pot. Then place cauliflower back into pot and let sit 2 to 3 minutes. In separate pan, cook the garlic with olive oil for approximately 2 to 3 minutes or until soft and aromatic. In the large pot, mix the garlic, cheese (optional), salt, pepper with the cauliflower and mash away! Remember to let cool and serve warm it’s the best way to enjoy this deliciously scrumptious recipe! Here’s an idea, if you plan on cooking this for this Thanksgiving, don’t forget to use the hashtag #YesYouCanRecipe for a chance to be featured on @YesYouCan!’s Social Media channels!